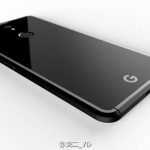 The final design of the Google Pixel 2 and Pixel 2 XL have claimed by the new leaks, which includes colors and storage configurations. Pixel 2 is less than a month away, and there are a lot of rumors as we approach the launch. People are aiming at the same market as the iPhone 7 and Samsung Galaxy S8. Last year Google Pixel and Pixel XL were launched in October 2016. The new product is launching this October too. Google is sure to make the Pixel 2 even better because it has learned a lot from its mistakes. There have also been rumors suggesting we may get three new Pixel phones. One rumor for the Google Pixel 2 is that the phone may come with a curved display when it launches later this year. Google has tried to put an order for curved OLED screens with the LG Display Company. This suggests the company is ready to embrace curved screens on the Pixel 2 and Pixel 2 XL. According to first look Pixel 2XL is complete with a metal and glass back, but the glass window this time appears smaller and the fingerprint scanner is in the metal part. It also has far smaller bezels than its predecessor. The original Pixel and Pixel XL were available in white, black, and blue variants. A new option called “Kinda Blue” will round out the color offering. Pixel 2 XL might come in black and white.